In the dustbowl depression of 1930s America, the Joad family from Oklahoma move to California out of desperation, lured by the promise of a mythical land of endless food and well paid work that doesn’t exist. For the first half of this book, I loved it. Steinbeck alternates each chapter between the Joads and a bigger picture of half the country on the move, hungry for work and hungrier for food. The travels along Route 66 were full of drama and tension and the characters well developed. It was a delight to travel along with them, poor and desperate as they were, dignified in their poverty, hoping as they did that they would find what they were looking for…but knowing that they wouldn’t, hoping at least for some resolution for them. Some of the writing was beautifully poetic, especially in the wider-world chapters. Tom pushed open the matchbox and took out a match. He struck the match against a piece of sandpaper and took the flame carefully to the lantern, and lit the lantern with the fragile yellow dancing flame. The lantern lit with a mellow dancing light against the walls of the shack. Tom sat back and warmed his hands on the feeble heat coming from the lantern. How about we try this, Mr Steinbeck…? Tom lit the lantern from a match and sat back, warming his hands on the feeble heat coming from it, the light dancing on the walls. …and then we can get on with the story. How would that be? No? Okay then, I’ll sit through the same drawn out descriptions every time someone does something, no matter how minor. What that happened throughout the last third of the book, it really dragged it down. Steinbeck also decided that he only really needed two characters (Ma and Tom), and the rest drop into the background and become two dimensional and superfluous. He might as well have killed the rest on the journey to California for the impact they have in the story. And the ending. Well, it just…ends. There are no conclusions, and we never find out what happens to the family. It’s like Steinbeck died halfway through and didn’t finish the story. In fact, I just checked online to see if my copy was missing a dozen pages. Nope. The Joad’s are flooded out of their shack of the week, and they come across a barn. Rose of Sharon (huh? ), who has just undergone a still-birth, gives an un-named starving man her breast milk. The End. After four hundred pages, some of the most wonderful and poetic language, that’s IT? Do the family starve? Do they drown? Do they go back to their shack after it dries out? Would it have killed him to write an epilogue? At that point I was glad to finish the damn thing and be done with it. No more Steinbeck for me. After the flat characters of “Of Mice and Men” and making me care about a desperate family and then leaving me hanging, he’s had his chance. This entry was posted in Reviews and tagged 2/5, Grapes of Wrath, Reviews, Steinbeck, tony talbot. Bookmark the permalink. I always felt the point of the ending was the endless desperation of the Joads and their fellow Okies. 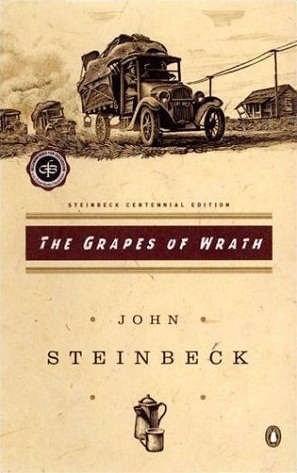 Steinbeck wrote the book to show the plight of the people who had emigrated from the mid-west, and their suffering. At the time, it was current fiction and it was purposefully political. It’s a symbolic end, not a definitive end.